A veteran deputy was caught on video, viciously slapping a child in the face over and over, and he's yet to be charged with a crime. Sandoval County, NM — Last August, Sandoval County deputy Fred Switzer, and another deputy were transporting a teenage child from a court appearance when things went shockingly awry. After the teen was placed in handcuffs and put in the back of the patrol car, Switzer took it upon himself to dole out not, one, but four hard slaps to the teen’s face. While the patrol car’s camera doesn’t have sound, the teen appears to move his head in a motion to spit at the officer. However, the actual spit was not caught on the camera, and even if it had been, it did not warrant the violent response to a handcuffed kid. Switzer, 70, retired from the Albuquerque police department as a lieutenant and has been with the Sandoval County sheriff’s department for eight years. However, he has since been fired. After a fellow officer had witnessed the assault, he filed a report with Switzer’s supervisors. Despite the incident happening six months ago, the video of the attack, and news of the officer’s firing was just released publicly. Young children often find themselves on the receiving end of police state violence while attending public school. In January of last year, Colton Granito, an 8-year-old boy with autism, threw a tantrum during class. Instead of following the boy’s IEP plan, police were called. Colton was handcuffed, transported to jail, and forced to sit in a cell for hours wearing a straight jacket. He was subsequently charged with assault and sentenced to probation. 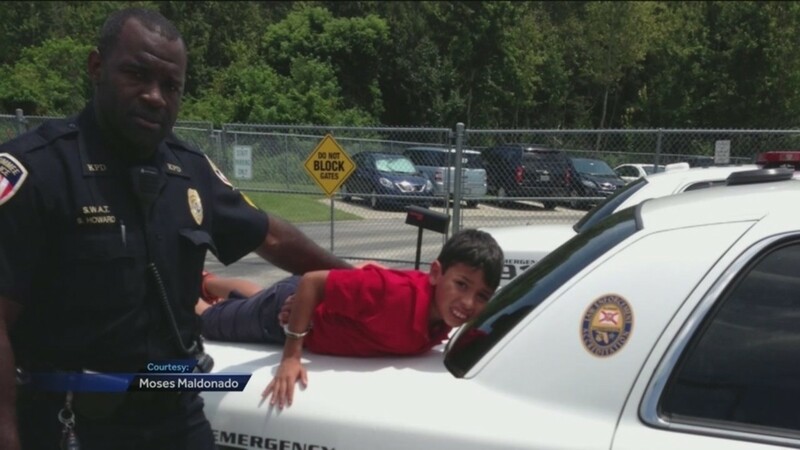 The photo below is of a 10-year-old child handcuffed, laid out on the back of a police cruiser. The boy’s name is Ryan, and he has autism. He misbehaved at school and was also arrested and treated like a criminal. In September of last year, we reported on body cam footage showing a 9-year-old special needs boy handcuffed as his father pleaded with the officer to release him. That same month, a highly disturbing video of cops manhandling a 13-year-old autistic child as he screamed for help emerged on Facebook. And these cases contain only autistic children. If you truly want a glimpse into the horrid effects of the police state on all children, take a scroll through our archives, at this link.